The Chios’ Maritime Museum is the realization of a dream by its founders - all being among those who make up the Maritime wonder of Chios. It was their wish to establish a residence - museum in one of the largest shipping centers, the island of Chios, which would represent the contemporary Greek maritime spirit. 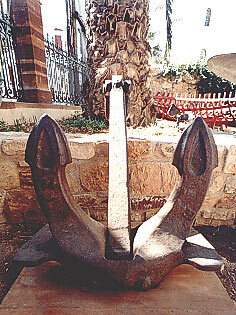 The Chios' Maritime Museum is located in the center of the city, housed in a mansion belonging to the late Anastassios and Marouko Pateras. The house was donated in 1991 by the inheritors of the estate to a public benefit foundation, which bears their name. The structure has two floors and was built in the beginning of the twentieth century. Its style is of the traditional island architecture of Chios with a neoclassical design and beautifully painted ceilings. In the last few years, the building’s interior and its gardens have been renovated to accommodate the display of its exhibits. The museum is an impressive landmark in the city’s center. The renovations and the operation of the museum were financed by the families of Ioannis D. Fafalios, Antonios C. Los, Ioannis M. Psarros, Costas I. Lyras, Tassos Diamantaras, Popi Romanou, Demetrios Laimos -Botsaris, Nikos C. Los, Marika G. Nikolou and the bequest of Kalliroi D. Patera. What is of particular interest is that the Chios’ Maritime Museum has covered a significant gap in the maritime history of the island, something that no other foundation in the city has done so far. Needless to say, it is well known that throughout the centuries, the people of Chios have contributed a great deal to shipping and commerce. One of the essential goals of the Museum is to illustrate this significant social aspect of the island by collecting and classifying historical information of the maritime tradition of the area, as was the developments in shipping and in commercial ships. The museum also hosts a series of lectures and conferences on the subject of Chios and shipping in conjunction with other museums of the Greek Archipelago. One of the main features of the Museum is a small, but significant collection of the Progressive Cultural Union of Vrontados (known locally as PEKEV) which consists of models, parts and instruments of ships and most significantly of portraits of sailing ships and steamships belonging to owners of Chios, painted by the famous native marine artist Aristedis Glycas (Vrontados, 1870-1940). These last items are impressive pieces of popular art and date to the late 19th century – early 20th century. Models of ships from different periods as well as rare photographs of maritime life complete the collection.